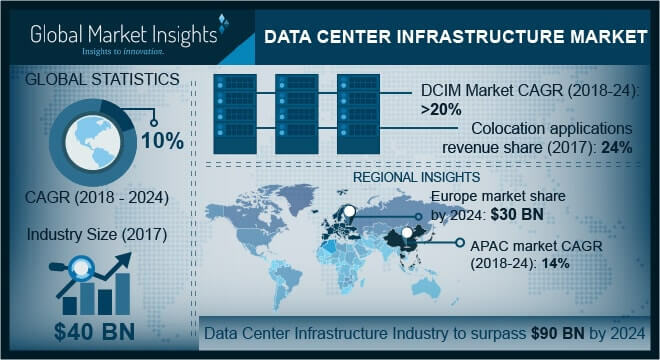 Data Center Infrastructure Market size is set to exceed USD 90 billion by 2024; according to a new research report by Global Market Insights, Inc. Rising digitalization and the demand for online services are making it vital for the operators to store and efficiently manage the data generated, which is expected to offer an impetus to the data center infrastructure market growth. Government initiatives aiding SME growth and the rapid increase in the organizational data are fueling the growth of data centers. This is causing a rise in the expenditure on infrastructure technologies such as cooling, power, and networking, among others. New and advanced technologies, such as evaporative and free cooling and facilities equipped with AI, also aid in augmenting the overall efficiency of the facilities, thereby driving the market growth. Rising investments by various business and companies across the Nordic region coupled with growing number of the facilities are anticipated to drive the Europe data center infrastructure market to reach over USD 30 billion by 2024. Current technological developments such as Industry 4.0, big data, and cloud computing are the major drivers of the Germany market. Increasing number of manufacturers is stressing on replacing human labor by automation. The incorporation of IoT and rise in the number of connected devices are contributing to the exponential rise in the data. Germany being a highly developed industrial sector, the country possesses a modern infrastructure and manufacturing & industrial sectors. Several manufacturing companies are stressing the need for enhanced facilities for their businesses, thereby driving the data center infrastructure market growth.